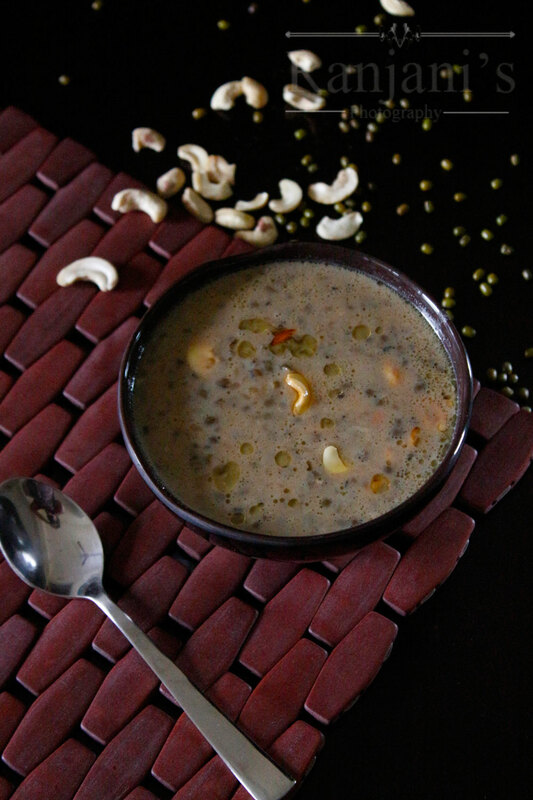 Pachai payaru payasam / green gram dal payasam – soaked and cooked dal again cooked in Jaggery syrup by adding very little milk and topped with ghee roasted cashews and raisins. It’s a creamy dessert to enjoy as hot or chilled. Although its perfect traditional south Indian festival recipe to prepare for neivadhyam during Navratri season. You can replace thick coconut milk and white sugar in place of cow milk and Jaggery suitably. It is good to include dals daily in our food. Every dal has separate health and nutritional benefits. We can make different recipes using it to avoid the boredom of preparing the same kind all the time. This green gram in Tamil as cherupayar or pachai payaru. You can make as Kanchi (porridge) using this green gram as savory version and serve for breakfast. This cherupayar payasam preparation method varies depends on location. I have seen this dish in Kerela, they prepare using basmati rice and pachai payaru and their signature coconut milk. I try to share that recipe also in future. 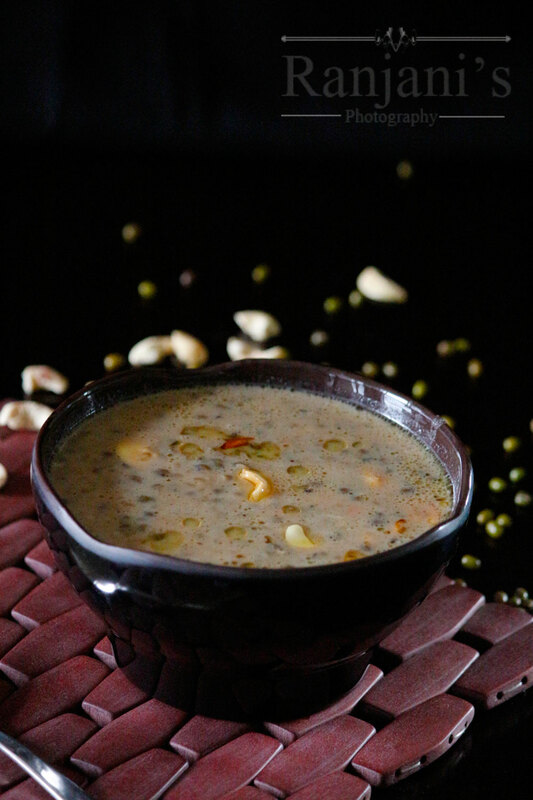 Here is the step by step method of how to make pachai payaru payasam recipe. Soak green gram in water overnight or 4 to 5 hrs. Pressure cook soaked pachai payaru to 4 hisses. Heat a strong bottomed vessel, transfer cooked dal into it. Once it starts boiling, add Jaggery syrup and salt. Cook on medium-low flame 5 to 8 mins or till the payasam semi thickens. Switch off the flame, add milk and cardamom powder to it. Heat a seasoning pan, add ghee, and roast cashews and raisins to a golden brown. Add it to payasam and mix well. It’s good to add dal daily in your food. Every dal has health benefit. You can have different taste of dal every day. Instead of milk you can add yogurt to the dal and this will also taste good. I’m sure you will like this taste.